Location, comfort, and spacious living in charming Olde Towne Bellevue. Conveniently located near Bellevue University, Bellevue East, and Offutt AFB. We have spacious 1 and 2 bedroom apartment homes to choose from (750-1,150 Square Feet). 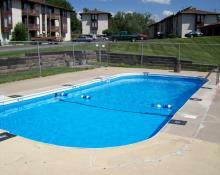 Our community features a sparkling swimming pool for your enjoyment. Also our apartment homes are equipped with patios/balconies, window coverings, walk-in closets, garages and economical gas heat. We are conveniently located in great Bellevue location close to Offutt Air Force Base. Give Gaslight Village a call today to tour your great apartment home.